Dr Virgil D. Cantini was a professor at Pitt and a believer in public art. He has several pieces in the Pittsburgh area, but that doesn’t mean that his work isn’t in museums as well – because it is. This talented man once said that he was inspired by the town squares and fountains in Italy where he was originally from. 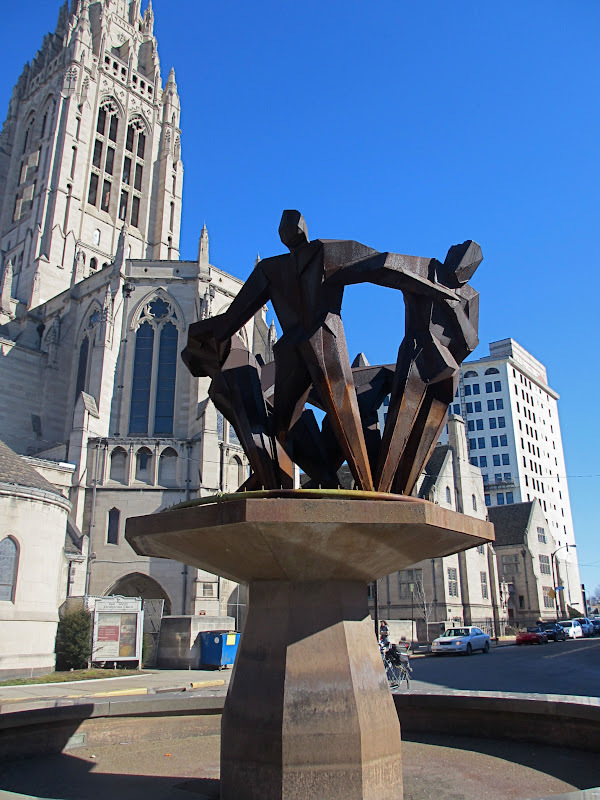 This fountain graces a spot in front of the beautiful East Liberty Presbyterian Church. The ultra modern style of the fountain is quite a contrast to the old style architecture of the church, yet the two seem to go together better than one might imagine. 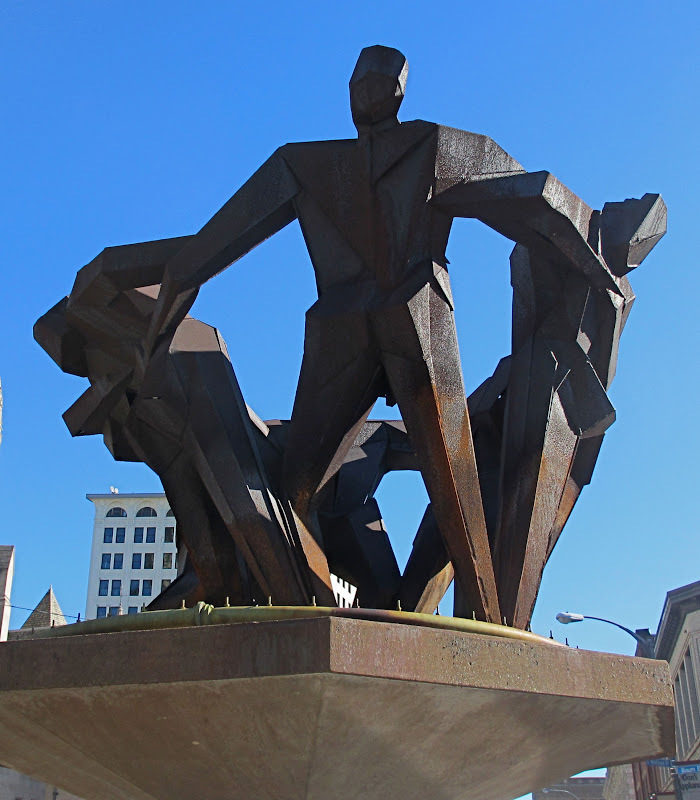 It was originally located at the East Liberty Mall, but moved to it’s present location in 2010. 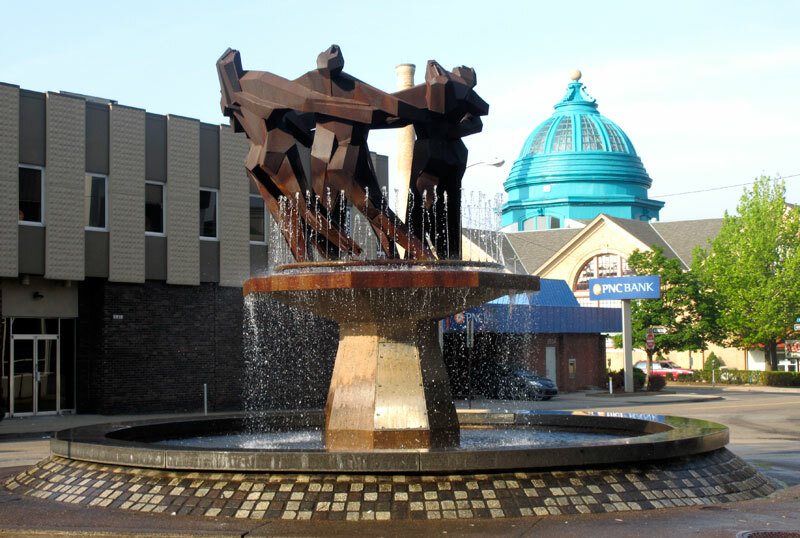 The fountain is made of Cor-Ten steel like the USX building. This steel will form a protective layer of rust on it. The sculpture is over 40 years old now, out in the elements and part of a fountain, so apparently the protective rust layer works well. "The person who built this statue was Italo O. Falvo. He was an ornamental iron worker who was employed by Reiling Manufacturing Company. Italo Falvo took Virgil Cantini's visualizations and made them a reality. Italo Falvo was an Italian immigrant from the town of Feroleto Antico, which was in the Southern Italian Province of Calabria. Italo Falvo died on March 24, 1976, about 2 months shy of his 61st birthday. He was survived by his wife Giovanna Falvo (who was also an immigrant from the same town, Feroleto Antico). Giovanna Falvo later passed away on November 24th, 2004, at the age of 76."